CROSS PLANES: The Class Hack 2: Eclectic Boogaloo for The Black hack is LIVE on OneBookShelf.com! The Class Hack 2: Eclectic Boogaloo for The Black hack is LIVE on OneBookShelf.com! Are you a fan of David Black's The Black Hack? Did you happen to enjoy The Class Hack and the The Race Hack? 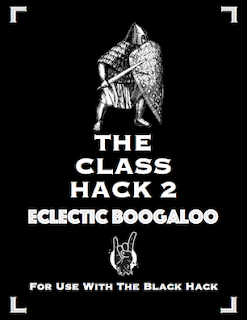 THE CLASS HACK 2: ECLECTIC BOOGALOO presents 15 Additional Traditional and Racial Classes. Part One presents Traditional Classes: Animator, Blackguard, Commander, Jester, Kensai, Knight, Psionicist, Samurai, Thaumaturgist, and Witch for you to play. Part Two presents Racial Classes: Drake, Gnome, Half-Orc, and Tiefling for you to play, as well.